We carry a full line of authentic Western badges inspired by the style of the Old West. Our Wild West badges include U.S. Marshal badges, sheriff badges, Texas Ranger badges, Pony Express badges, prison guard badges, Indian police badges, Pinkerton detective badges, and more. Many of our historical badges are reproduced from originals held in museums and private collections. These law enforcement and traditional star badges possess a similar weight and feel to the originals. A number of these antique badges of the Old West are crafted from silver-plated brass with sturdily-mounted pin fasteners. Our collectible badges are great for costuming, stage productions, or display. We even provide a number of badge sets that come with decorative boxes or plaques, making them excellent gifts, as well. Abilene Texas was the original end point for the Chisholm Trail and an important part in the settling of Texas. The Abilene Deputy Sheriff Badge is a great recreation of the badges worn by those who protected the town. Alcatraz was located 1.25 miles off the coast of San Francisco and housed the most ruthless criminals in the US. 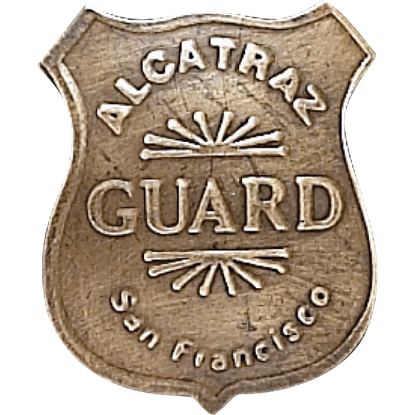 Add a recreation of the Alcatraz Guard Badge to your collection. This badge is shaped into a shield style design. 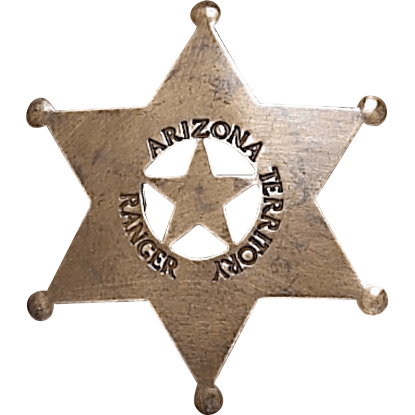 In the days of the old West, badges were common and often worn by those in positions of power, ranging from lawmen to government officials, and more. 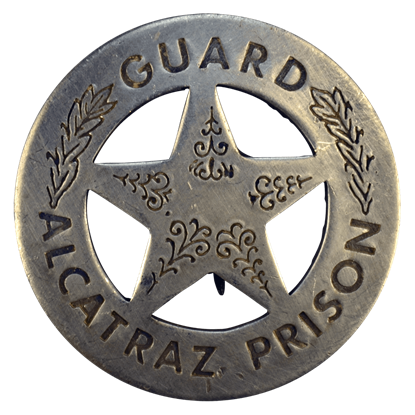 This Alcatraz Prison Guard Badge recreates one such badge from the West. The Apache Nation lived in large areas of the Southwest before being removed in the 1800s. 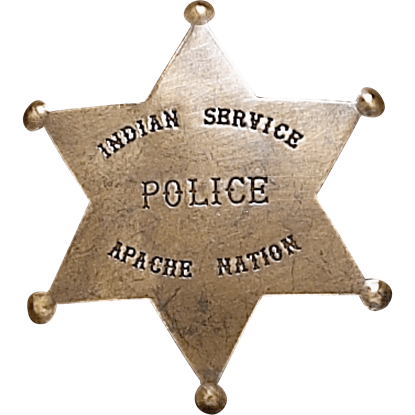 The Apache Nation Police Badge is a recreation badge from their self regulated police force after their forced removal from their native land. 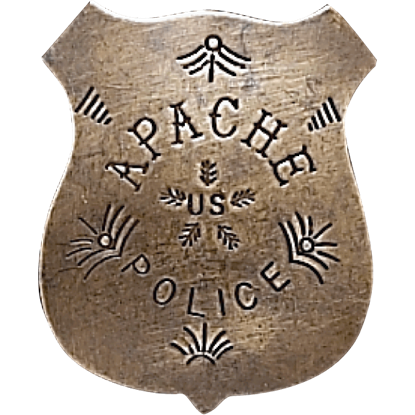 This Apache Police Badge is a recreation of a badge from the nations self regulated police force after their forced removal from their native land. This historical recreation badge is in the standard shield shape. 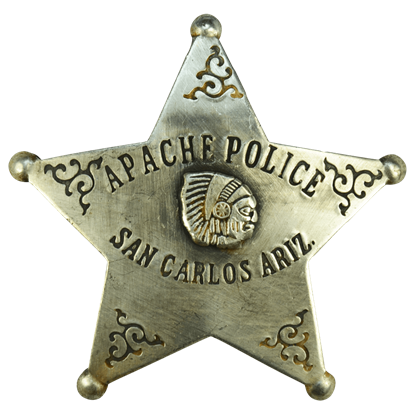 In the days of the old West, badges were common and often worn by those in positions of power, ranging from lawmen to government officials, and more. 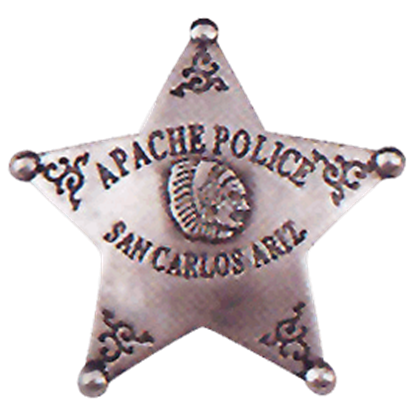 This Arizona Apache Police Badge recreates one such badge from the West. 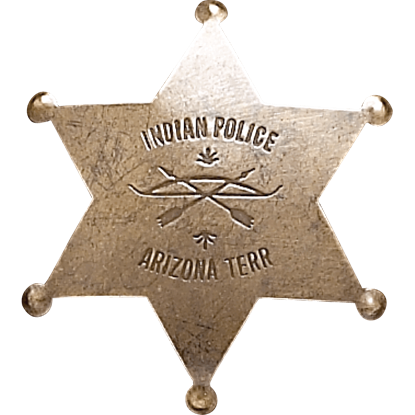 Worn by those who protected the resettled natives in what would become Arizona, this Arizona Indian Police Badge is a great recreation. Crafted into the six-point star this piece would make a great addition to any badge collection. 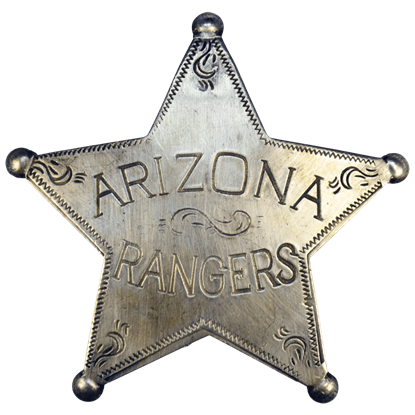 The Arizona Ranger Badge takes you back to a time when Rangers were the law of the west. Crafted into the classic six-point star, this badge not only features the officer title but a five-point star center cutout. 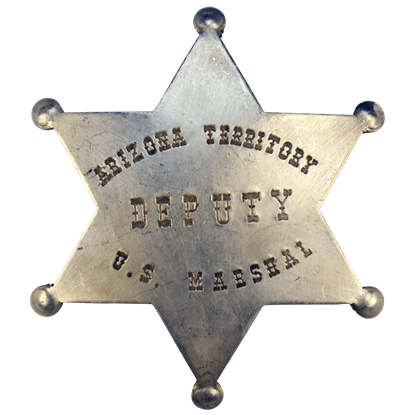 In the days of the old West, badges were common and often worn by those in positions of power, ranging from lawmen to government officials, and more. 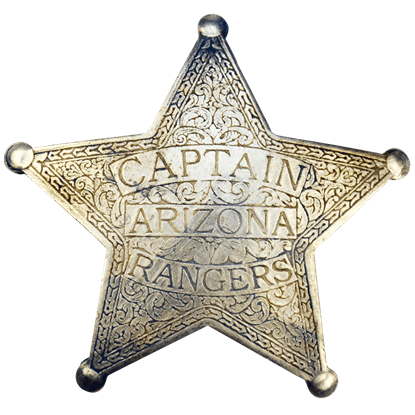 This Arizona Rangers Captain Badge recreates one such badge from the West. 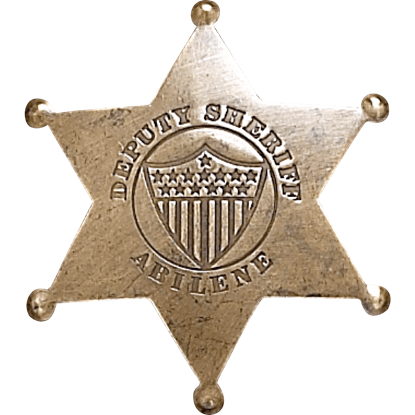 In the days of the old West, badges were common and often worn by those in positions of power, ranging from lawmen to government officials, and more. This AZ Territory Deputy U.S. Marshal Badge recreates one such badge from the West.